Lixit Bowls and Water Bottles. The Lixit Seed Stick Holder for Small Animals fits seed sticks 4" and longer. 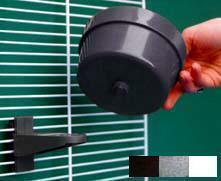 The Seed Stick holder uses Lixit's patented Quick Lock Bracket with "Seed Saver" Base that catches loose seeds. Great for carriers and travel or smaller birds, such as parrotlets, lovebirds, cockatiels, conures, caiques and similarly sized birds. Easy installation and simple removal. Just twist and lift. Cup releases while holder stays in place. Great for fresh foods! Assorted colors of our choice. Comes in aqua, purple and clear. Easy installation and simple removal. Just twist and lift. Cup releases while holder stays in place. Great for fresh foods! Quick Fill Bottles have flip top lids and a precision stainless steel valve. Flat-sided bottle hugs the cage and comes with an easy to use bungee attachment. Bottle made of PET plastic and is BPA free. Fits most cages. Easy to install. Non-Toxic, USDA approved, rubber stopper. Just pull out to use. Designed to clean any type of pet water bottle. A MUST have item if you use water bottles.